Looking to buy safety gloves in Rochester NY, Ithaca NY, and Western NY at competitive prices & with exceptional service? 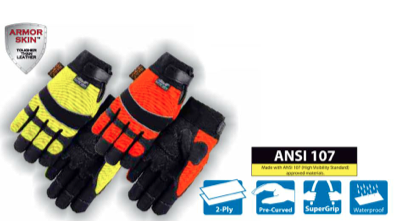 The Duke Company proudly carries the finest Safety Gloves – ANSI 107-2010 Class 3 Safety Gloves in High Visibility Yellow and High Visibility Orange. Palms constructed of durable Armor Skin and equipped with slip protection and shop protection via PVC palm patches. Highly engineered design with pre-curved fingers and double wishbone palm. Provides helpful protection agains fatigue.